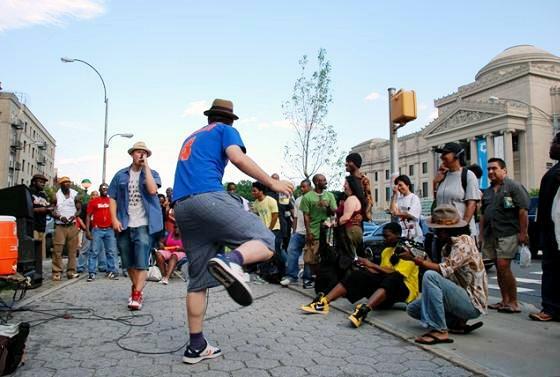 If, as the saying goes, architecture is frozen music, then urban planning is composition, but Placemaking is improvisational street performance. It’s interactive, messy, inclusive, and you can never be quite sure what the result will be–but you end up with something unique and truly authentic to the people who participate. We’ve put together a list of five handy tips for all of you Placemakers out there to help you navigate the exciting, often unpredictable process of creating great places in your community. Click here to read five tips to help enhance your next Placemaking campaign! Officials from Barcelona’s public market program came by PPS HQ recently for a discussion with NYC’s market leaders. Check out some of the fascinating things that we learned about this truly remarkable urban food system! When they decided to create an open-air gathering space in their neighborhood, Nathan Martin’s company Deeplocal approached the challenge of making a great place the same way they would any creative project: prototyping, LQC-style! This past week, the CIRD announced that four organizations in Florida, Kentucky, New York, and Texas (out of 30 applications from across the US) have been selected to host design workshops in rural communities in 2013.